So Windwaker is apparently going to be released on the WiiU. What’s with all those town and dungeon videos? I literally couldn’t recognize the game without the massive amount of boat travel required to go through the main quest alone… I spent hours getting all the sunken treasures in that game. 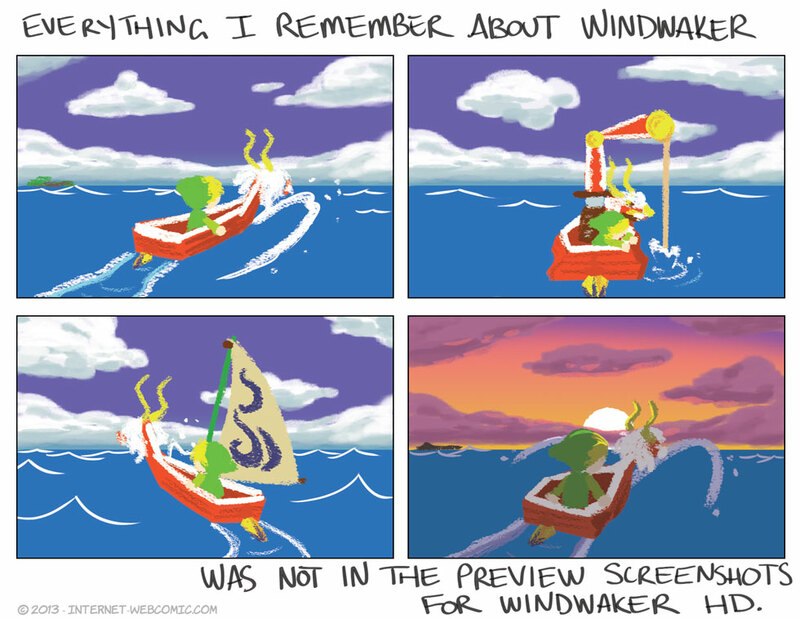 It’s beautiful, but I don’t think the vast ocean of Windwaker is something I ever plan to traverse again, HD or no. I definitely will however! They did mention they will fix some things, so perhaps they will speed up the boat or make the map a little bit smaller? Why would we want that? Wind Waker was amazingly stylized and that was the best thing about it. These screenshots look like the worst of both worlds – stylized character design with “realistic” rendering (with way too much HDR bloom). I’d take Nintendo much more seriously these days if they were to actually develop new stuff instead of doing endless clumsy rehashes and remakes of actually-good games. Was hoping for a remake of MM, but WW was still awesome. Don’t think WW really needs an update in graphics, though. The cel-shaded style was simple enough to where it still looks fine today. Ah well, I’ll probably still play it, WW was one of my favorites. Wind Waker on a PC in HD using the Dolphin emulator is one of the most beautiful games I’ve ever had the pleasure of playing. This new remake looks terrible in comparison. I’ve heard about that but never looked into it. Sounds neat, but what games can it run? Provided your computer is fast enough, most Gamecube and Wii games.